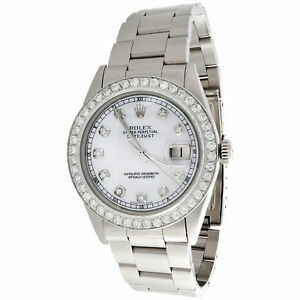 Details about Mens Rolex 36mm DateJust 16014 Diamond Watch Oyster Band White MOP Dial 2 CT.
*$242 for 24 months. Minimum purchase required. It's always a little scary when shopping on line with higher end items. This was a painless transaction. The customer service was top notch and great The watch was beautiful with no issues. They will be the first ones I go back too to find another Rolex watch. Nice patina for this watch. I am happy for having bought this watch.